Waking Life Review: A visual experience like no other – AiPT! Waking Life is a strange experience to say the least. Waking Life is a strange experience to say the least, and one in which I shifted my final verdict around several times before the credits. This film is for no one, and everyone at the same time. The subject matter is quite niche, exploring heavy existential themes that we would barely touch on in our everyday lives. The movie aims to inform the uninformed, and show them that these themes apply to everyone. No matter where you are on this earth, existentialism is a topic that will make anyone ask questions about themselves and the world around them. Waking Life executes it’s themes like no other and in an effective but totally unorthodox way, making it a completely different experience for everyone, and definitely making it a hell of a lot harder to review. The first thing you’ll easily notice from the moment you press play is the animation. It certainly is one of the strangest and most fascinatingly animated films to come from the 21st century so far, mainly because of it’s unique use of the rotoscoping technique. For those who don’t know, rotoscoping is the manual animating process of tracing over a previous drawn frame on clear sheets to create realistic movement within characters and objects. Waking Life removes the need for clear sheets, and is one of the first films to rotoscope using computer programs. This change in technology is evident in it’s incredibly deft and fluent movements, as well as the almost impeccable shadow movements. I think it’s the abstract shadow movements alone that make this movie different from anything before it. For example, classic animated films such as Snow White had little to no facial shadows at all. Different animators are used throughout the film, a factor that creates lots of positives, but unfortunately a few negatives, too. Some of the more ‘painted’ scenes in the film look stunning, most notably a scene towards the beginning with the stars of the ‘Before’ trilogy, which has the best shadow detail in the whole film. There are many other examples of complex movement being translated using pen, such as consistently accurate mouth movements in every art style, something that is difficult to get right in animation. The shift between two styles is never powerfully jarring, but it is slightly noticeable in a few scenes, nothing that detracts from the film though. However, the multiple art styles and the rotoscope execution have some annoying features that are worth mentioning. Because Waking Life is copying pre-recorded footage instead of previous frames, the animation ends up emphasizing some of the cinematography flaws. Mildly shaky handheld shots turn into a mushy messes of layered colors, which becomes a little sickening to watch after seeing numerous accounts. The multiple styles don’t really add much to the film either and you’ll find yourself comparing the not as good ones to the better ones, instead of appreciating them all. The protagonist of Waking Life is a difficult one to directly explain. He is placed in an unwakeable dream where the people around him question the mind, reality, and free will; some heavy stuff. What he actually represents in the dream isn’t really set in stone, and leaves room for interpretation, an excellent choice for an existential film. Whilst his presence isn’t as prominent as I would have liked, and developments in his character are few, his role is nonetheless a smart inclusion that suffices as an interesting centerpiece for the plot. When it comes to character conversations, the substance is not comparable. The aforementioned themes are talked about in situations that don’t seem too far removed, a nice touch that makes it a smidge more relatable. I found the presentation of all the philosophical ideals to be well proportioned, almost never forcing you to believe something, and instead just making you think. Even to those genuinely interested in the subject, personality is something lacking in many of the characters, making many tedious to listen to. I zoned out several times during the film, just due to the lack of engaging voices. The whole film is a constant cycle of one-sided conversations that feel hugely disconnected from the ‘protagonist’ and ourselves. The dialogue is actually quite interesting when you are focused, but you’ll constantly find yourself either being distracted by the art, or just getting a blank mind, waiting for something really revelatory to come your way, with nothing never truly arriving. It does come close to reaching it’s potential during the last forty minutes, where characters are brought back and the protagonist begins to speak more, but it is still weighed down by the first hour. The ending monologue is the only especially memorable part of the plot. The simple fact is that Waking Life is a bit of a repetitive slog for a huge chunk of it’s runtime. It wastes so many chances to leave a lasting impression in any way other than with it’s art style. I may not have liked it, and although it couldn’t drag me into it’s subject, I still feel like others may enjoy it’s philosophical documentary style. I can see Waking Life as a film that people either really love, or really loathe, but it can’t be denied that it is an overall ambitious project. Existentialism is not the most entertaining theme for mainstream audiences in the first place, so creating a whole movie that questions humans constantly is an unquestionably risky endeavor. The way the movie tackles existentialism is very blunt and in-your face, an execution style that has a lot more cons than pros. 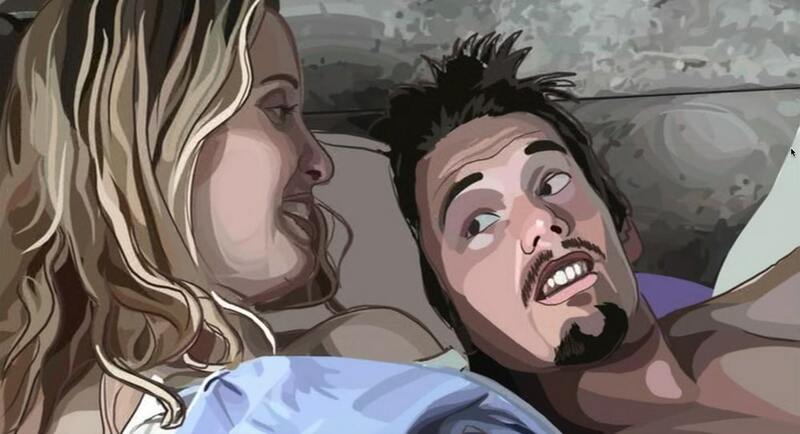 'Waking Life' can be repetitive at times, but those who are interested in the movie's subject may find it interesting.